Lindsey and Mark picked the W hotel Chicago lakeshore for their wedding for its view over navy Pier. Months before, while visiting Chicago, Mark proposed to Lindsey on the Navy Pier wheel. Therefore, when they start planning their big day, they decided to have their wedding in Chicago and with a view on the wheel. We took off with the party to take pictures on Lasalle bridge and then we headed to the Pier. Since the time Mike proposed, the wheel has been rebuilt to celebrate the Centennial of Navy Pier. We took a ride on VIP shuttle and framed the town in the background. The Centennial Wheel at Navy Pier. A view of Chicago from inside the wheel. The ceremony took place on the terrace of the W Chicago Lakeshore. The reception in the room Altitude, offering a panoramic view of Chicago and located at the 33rd floor of the W chicago Lakeshore. The sun was about to set and the light was casting a beautiful warm glow in the room. I had met Mike and Lindsey several months before, in december, when I shot their engagement session in downtown Chicago. The winter has a vibe of its own and you can see their pictures here. 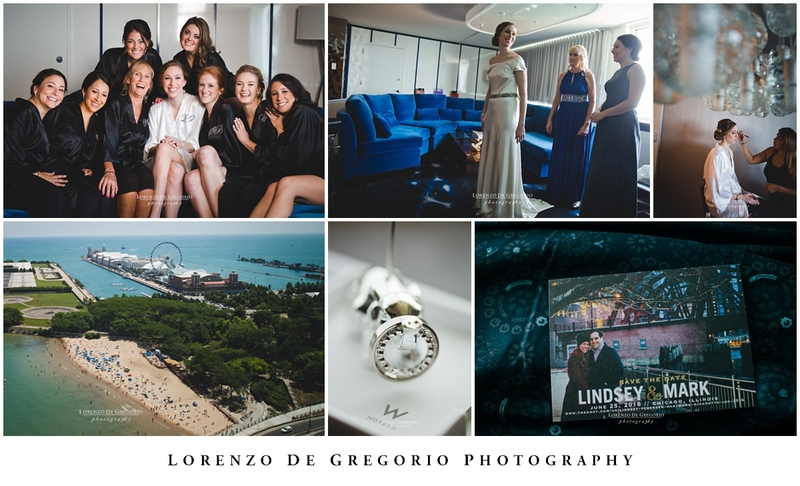 If you are curious to see a Navy Pier wedding, then check the post of Erika and Tristan here. And to find out more about Altitude, go here. The wedding was coordinated by Annie at Plum and Ivy events.